Annabelle has discovered a startling fact. She can instantly transport herself to the destination on her satnav. Although ghostlike when she travels, her remarkable ability takes her from England to France, Croatia and beyond. As she explores her potential it puts her life and the lives of those she loves in danger. and leads her into the path of an enigmatic and intelligent serial killer. I’m so pleased with the reviews received so far – Thank you to everyone who has taken time to leave a review. Reviews are the life blood of indie authors and publishers. “M.W. Brown hooked this reader from the get-go with the story of Annabelle! The epilogue definitely sets the genre stage as a thriller ~ severed hand anyone? Wonderful character and plot building into quite the suspenseful read. 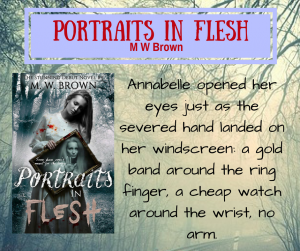 Excellent writing ~ sucked me right in and along with Annabelle as she transports herself around the world until she stumbled upon a serial killer. An emotional roller coaster with feelings of hatred towards Bardell and anguish, heartbreak, wonder to name a few others. Loved it…Fabulous. Couldn’t put it down. Looking forward to the sequel. Wow! Portraits in Flesh is so totally unlike any book I have ever read. I read it in one sitting because I just couldn’t put it down. While the story-line is mostly dark and disturbing, there are moments of love, joy and friendship scattered throughout the book. Very well written. Ready to be on the edge of our seat? ?